John Hancock (1737-1793) was a Boston businessman and supporter of the revolution who later held several important political offices, including the presidency of the Confederation Congress. Born in Braintree, the same town as John Adams, Hancock was orphaned at a young age and was sent to live with his uncle, Thomas, a wealthy Boston merchant. John became Thomas Hancock’s de facto son and was given training in how to manage the family business, which he eventually inherited in 1764. Hancock’s interest in the revolution was initially based on self-interest. He was angered by the Sugar Act and Townshend revenue acts – not on political grounds but because they threatened the profitability of his business. On the Stamp Act, he was more moderate, believing that Americans should accept it while protesting to parliament. In 1768 Hancock’s employees, who sometimes engaged in smuggling and evasion of duties, became embroiled in several incidents with customs officials. The best known of these was the seizure of Hancock’s ship Liberty and its cargo of wine, which led to Hancock being sued for customs evasion, though the case was later dropped. 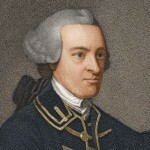 This incident radicalised Hancock’s attitude towards Britain; so too did his growing friendship and collaboration with Samuel Adams. By the mid-1770s Hancock was providing tacit and financial support to Adams and the Sons of Liberty. In 1774 Hancock was elected president of the Massachusetts Provincial Congress, a body that formed illegally after the colonial legislature was closed by the Coercive Acts; to the British, holding this office marked Hancock as a criminal. Though Hancock did not attend the first Continental Congress, he served in the second, eventually acquiring fame as the first and largest signature on the Declaration of Independence. Hancock served in the Confederation Congress for the duration of the Revolutionary War, serving as its president for two years. He also served as Massachusetts governor, during which he pardoned most of the farmers involved in Shays’ Rebellion.